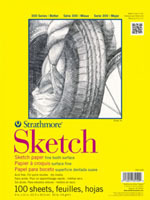 This light weight sketch pad is suited for classroom experimentation, practicing of techniques, or quick studies with any dry media. It is acid-free and lightly texture. Each pad contains 100 sheets of 50lb bright white paper, gummed binding or spiral bound available. The 18 x 24 pad is spiral bound and contains 30 sheets. Wire Bound Sheets are micro-perforated and are Actual Size when removed at the micro-perforation. Glue Bound Pads have flip-over covers. 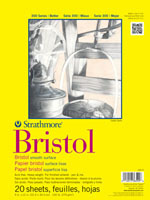 For finished artwork this high quality bristol weight board comes in two surfaces. Smooth is rated very Good for mechanical drawing, marker, airbrush along with pen & ink. Vellum is rated Very Good for graphite pencil, colored pencil, charcoal, sketching stick, mixed media, airbrush and oil pastel. Creating art on our new Black Canvas paper is a fresh and inspiring way to make paintings that pop. The black background allows colors to take center stage and lets the artist create dramatic shadows for an inspiring look. 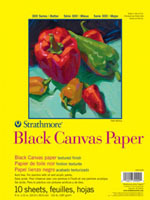 This bold black canvas-textured paper is great for practicing techniques and making finished art. The classic canvas texture works with oil and acrylic paints. 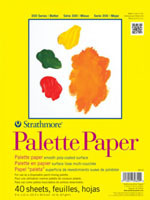 This economical, heavy weight student-grade paper is best suited for beginning watercolorists or for experimentation and perfecting techniques. This paper has two distinct surfaces: the felt ( top) side is cold press the most popular surface for most watercolor work, while the other side is smoother and is ideal for detailed work. All pads contain 12 sheets of paper. Also available in a 24 loose sheet pack. 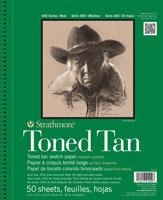 A heavier weight natural-toned newsprint for practicing sketching and drawing. A medium weight student grade drawing paper for final artwork. It has good erasability and works very well with a range of media. 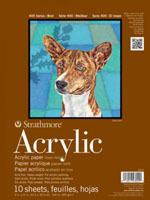 One of the most versatile sheets Strathmore offers, this cream colored drawing paper is ideal for sketching and most finished work. Wire Bound sheets are micro-perfortated and are Actual Size when removed at the micro-perforation. 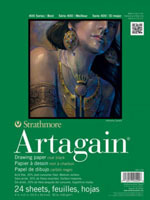 Strathmore's 400 Series Marker paper was developed for fine artists who create finished art using markers. The smooth surface allows markers to glide and blend easily. Colors look vibrant and crisp. The acid free, heavyweight sheet is bleed and feather resistant so artists can apply multiple layers of color. Proudly made in the USA. 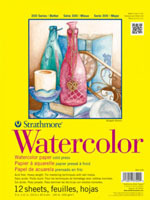 Media Applications: Alcohol-based markers, water-based markers, solvent-based markers, pen & ink, mechanical pencil. Weight: 50.5 lb. 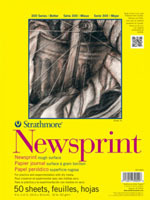 (24" x 36" x 500 sheets) 190 g/m2. 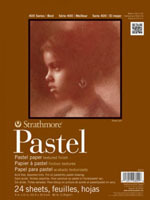 Strathmore's 400 Series Pastel Paper is fantastic for all pastel artists. 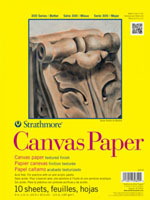 The textured finish and subtle colors of this paper make it ideal for oil pastel. Also suitable for soft or hard pastel. 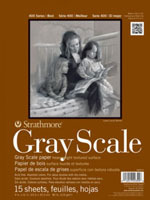 Strathmore's 400 Series Gray Scale paper pad contains textured heavyweight paper in gray scale colors ranging from white to black. There are three sheets each of white, black, and three grays. 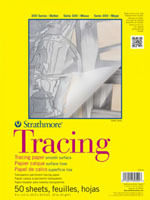 It is great for value studies using charcoal, pastel, chalk and sketching sticks. This paper combines the characteristics of watercolor paper with the finish of a drawing sheet, creating the ultimate paper for combined mediums. For studies or finished art. Heavy weight paper. Heavyweight linen finish is perfect for acrylic painting. 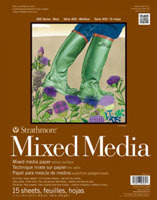 Pad Features: Glue Bound pads with flip-over covers. 10 sheets per pad. 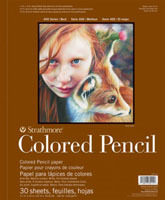 Our 400 Series Colored Pencil paper provides a clean white, toothy surface that is ideal for a variety of colored pencil techniques. Smooth, even coverage can be achieved, and the durable surface stands up to repeated erasures and reworking. The heavy weight combined with the vellum surface allows for the application of multiple layers. Wire Bound pads are micro-perforated and are Actual Size when removed at the micro-perforation. Acid free. Available in Warm Tan and Cool Gray. 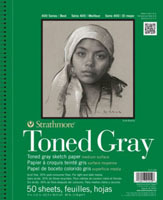 This sketch paper is ideal for light and dark media. 100% recycled, contains 30% post-consumer fiber, acid free. Available in spiral bound softcover sketchbooks as well as Hardcover, glue bound books with a stylish brown vinyl finish. Created in 1893, this 100% cotton bristol is an industry standard. Plate Surface has an ultra-smooth finish thatis unsurpassed for detail work using traditional pen and ink tools, specialty pens, specialty markers and airbrush. Semi-smooth, our newest surface, is slightly textured. It is suited for pen and ink tools, pencil along with specialty pens and markers. Vellum Surface has a toothy finish that is excellent for graphite pencil, colored pencil, sketching sticks and specialty pens and markers. It is also is very good for charcoal, pen and ink, airbrush and light washes. Not recommended for traditional watercolor techniques.